Driving along the bluff of Shades Mountain on South Shades Crest Road, it occurs to me that what Kendall wants to be when she grows up is a real estate tycoon. As we pass by homes designed for people in a higher income bracket than myself, she informs me of which ones she wants to buy. She says she likes "houses with gates, houses with fountains, and houses that look like banks." Last night was Emily's final night at Stoney Creek Camp, and we drove up to Cullman to see what she and the other girls in her cabin had put together for "skit night." Skit night is no small affair. If you think you're getting in and out of there in 30 minutes, you've got another thing coming. 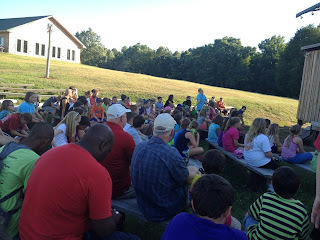 First the kids lead the crowd in a bunch of songs; then there's a devotional; then there are personalized awards given out for every single camper; then each cabin shows off their group cheer; then the camp counselors get awards... THEN they get to the skits. It's like Ryan Seacrest repeatedly teasing the audience about who's going home tonight on American Idol -- only this takes place outside in 100-degree heat. 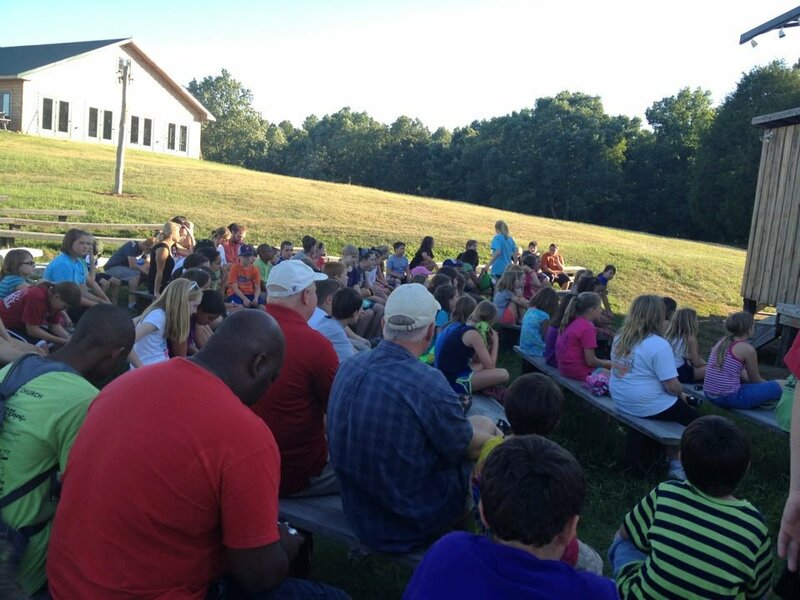 With 8 different cabins, the skits were all over the map. There was a group that sang "So Long, Farewell" from The Sound of Music. Another group's skit involved a talking goose that dispensed advice. The crowd favorite seemed to be a skit that revolved around a support group for recovering bubble wrap popping addicts (believe it or not, it was a surprisingly mature subject matter for a group of young girls). For the skit from Emily's cabin, eight girls hid under a sheet pretending to be a centipede. The joke at the end was something like, "oh no, I think the centi peed." Earlier in the evening Emily had received the "cute comedienne" award, so I wondered if that bit of humor came from her. During the production, Kendall ran around and played with other kids who weren't yet old enough to attend camp themselves. When it was all over, Kendall asked Emily if she would please come home a night early because she missed her so much. It broke her little heart when Emily declined. 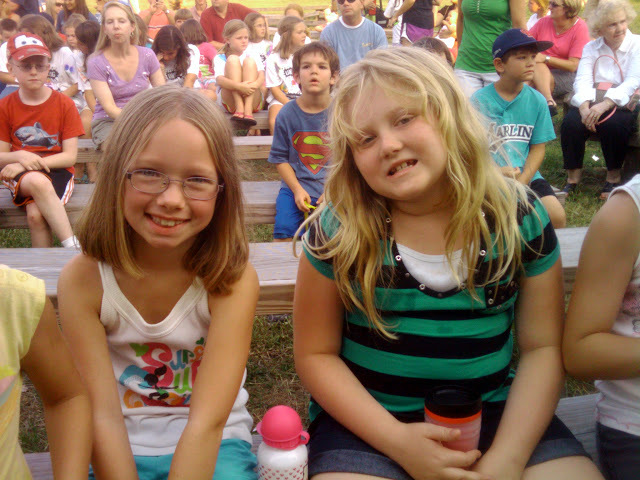 But at least by wanting to stay, it's clear that Emily has had a good time at camp. When Misty offered to let Kendall sleep with her in our bed, I don't think she expected Kendall's entourage to come along. Daisy must know that Kendall misses her sister, sleeping next to her on the bed last night. Very rarely does she sleep with the girls. Then when I got up this morning, I found Daisy and Kendall cuddled up together on the couch. She may not be Kendall's best friend, but she's a close second. Emily is somewhere in this crowd. Emily left for camp today. She's been so excited about going that she's insisted that she wouldn't be able to eat or sleep over the weekend. She was ready to pack her suitcase last Thursday. My favorite was when she told me that she was so excited about camp that she thought her face was going to explode. Since the bus to camp was picking kids up from the church, Misty took Emily to work with her today. Emily wanted to board the bus as soon as it pulled up at the door an hour before departure, but Misty made her wait inside (sitting in a parked vehicle isn't a great idea in this heat). As soon as they were allowed though, Emily and her friend Raven were the first ones on the bus, planting themselves in the first seat (my guess is that their seating choice was intended to allow them to be the first off the bus, too). Emily wasn't the only one excited about her departure, though. Kendall registered her own enthusiasm because, as she pointed out, she'd get to play on the Wii without interruption. Of course, today Kendall said, "I wish Emily was home already." It's tough to be without your best friend. 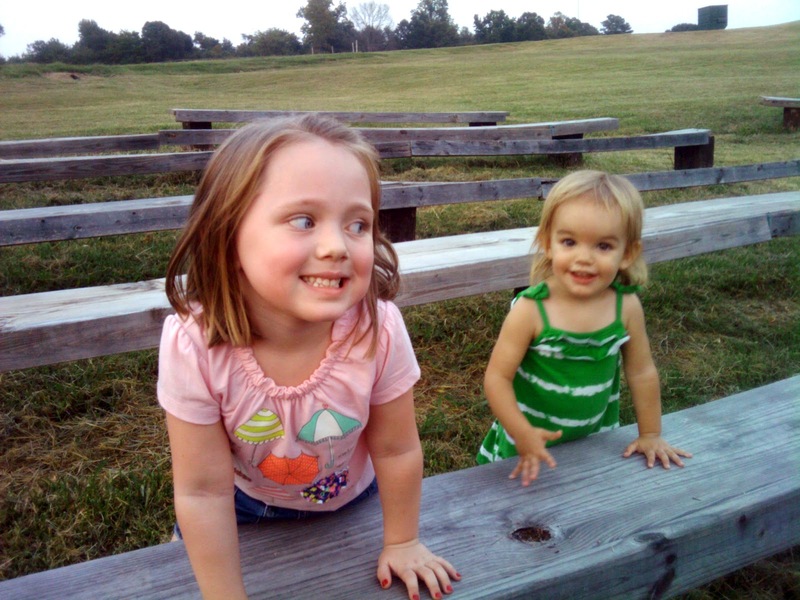 These sisters drive each other crazy, but they can't bear to be apart either. This is why I wish my wife had time to take up her old food blog again. 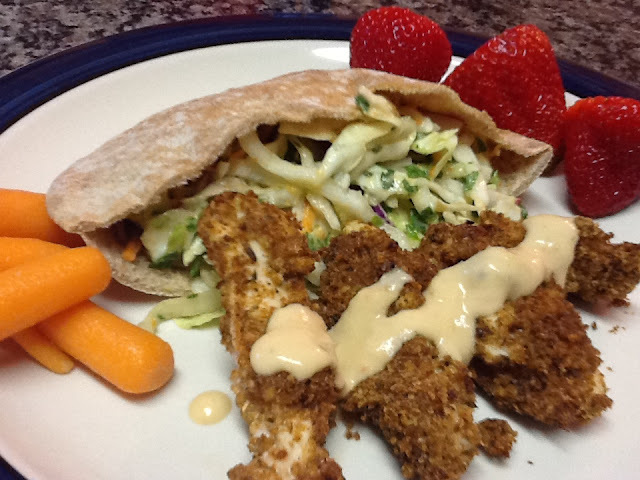 Over the weekend she made this Falafel-Crusted Chicken with Hummus Slaw (plus strawberries and baby carrots) from a recipe in Food Network Magazine. It looked good, it tasted good, and it was healthful. That's pretty much the norm in Misty's kitchen. Kelly Macdonald has a thick Scottish accent. That should be no surprise -- she is from Scotland, after all. I suppose her authenticity is partly what led Pixar to cast her as the lead in "Brave" (in contrast to Dreamworks relying on the fake [and annoying] Scottish accent put on by Mike Myers in "Shrek") -- that, and she's an excellent actress. But hearing Macdonald's voice over the years, from "Trainspotting" to "Boardwalk Empire," has gotten me accustomed to it. Despite her brief appearance in the final Harry Potter movie, my kids have not had that luxury -- something that became apparent when Emily attempted to quote the tagline she's been hearing repeated in the previews for "Brave." Emily's version: "If you had the chance to change your feet, would you?" The temperature hit 101° today in Alabama. The pool was as much a necessity as it was recreation. We only got an hour there, but it was an hour well spent. After being tempted on at least three other occasions, I finally gave in and tried the peanut butter burger at Mugshots. Since peanut butter was the only topping, I opted to add jelly, making me feel like a kid ordering some bizarre, but comforting, concoction. Numerous words of praise I'd seen for peanut butter and jelly burgers gave me high hopes though. Some people had even recommended adding bacon, so I did that too. In the end, it was good, but not great. At Mugshots, I'd grown accustomed to blissful sighs of happiness with every bite of my usual order of their MacDonald burger. So switching to the peanut butter burger led to somewhat unfair disappointment. Even the fries didn't taste quite the same, but since Misty loved hers, I'll chalk that up to the possibility that French fries just don't go well with peanut butter and jelly. After Mugshots, we tried a new place for dessert -- Steel City Pops. 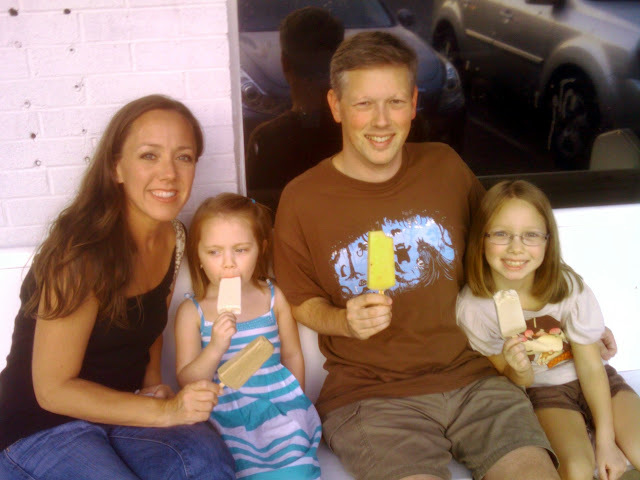 This little shop in Homewood serves up frozen treats on a stick (normal people would call them "popsicles," but technically that's a brand name), and it was packed with people both inside debating over flavors and outside enjoying their cool snacks. Steel City Pops has some unique flavors on their menu -- stuff like cantaloupe, avocado, or blood orange. But even with exciting choices like those, Kendall ordered vanilla bean, Emily picked peanut butter, and Misty opted for coffee. I felt that a "plain" flavor defeated the purpose though, so I selected pineapple jalapeño. I have never had such a spicy popsicle (see, even I did it, I called it a popsicle). It was great though, as was Kendall's simple vanilla, which I polished off for her in a welcome cool down for my tongue. It was still light out, so we stopped by Homewood Park to let the girls play for a while. The Movies in the Park series was getting ready to begin, so it was plenty crowded there too. The movie actually helped us out, since when it began a police officer came along herding all kids out of the playground -- that made it much easier to convince our own kids that play time was indeed over. It was a nice relaxing evening to end another stressful week. Kendall and Emily helped Misty make this dessert from a recipe found via Pinterest. It's called Sopapilla Cheesecake, but Misty said you could have just as well been called "cinnamon cream cheese bake." Sopapilla Cheesecake sounds fancier, though. Whatever you call it, it's delicious. 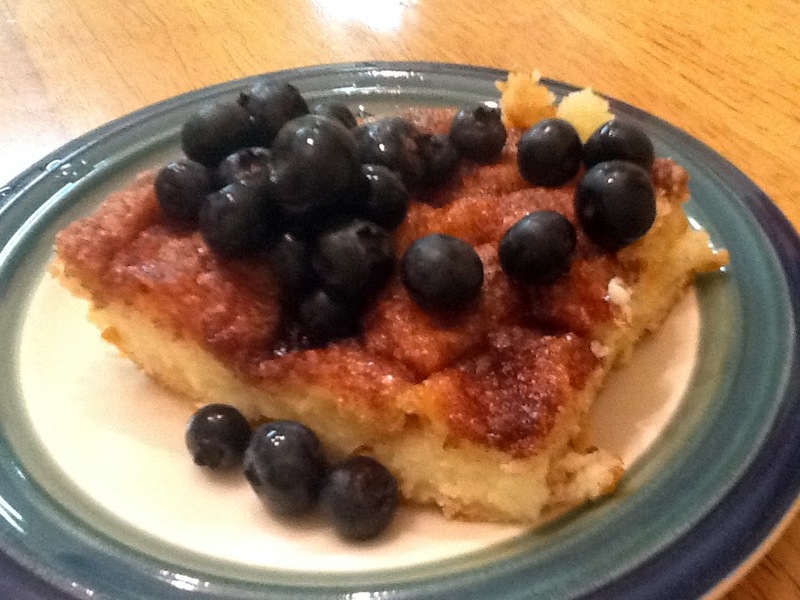 We added some blueberries on top to disguise it as "healthful." And as an added bonus, the girls didn't like it (I think they're being ridiculous), so more for Misty and me! Father's Day was a little weird this year, thanks to my weird kids. And that's exactly what I love about them. First Emily, Kendall, and their cousin Miriam collaborated on a joint homemade Father's Day card for my brother and me. The front read, "To our Dads," which cracked Jeff and me up because it made us sound like a gay couple. Later my girls gave me a couple of candy bars along with some post cards they'd made. But the best part was a Rwandan flag on which they'd written, "Dad is our Pressidunt." My favorite thing about Father's Day is having those two girls for daughters. The cousins were so excited to see each other again today after almost a year. Kendall and Emily had been counting down the days until they got to see Miriam. Apparently, it was the same for their young cousin -- she'd been asking repeatedly when Kendall and Emily would get here. No one seemed that interested in seeing Uncle Matt and Aunt Misty or Uncle Jeff and Aunt Kim, though. We need better PR agents. And now for another episode of "Baffling Conversations with My Kids." During dinner tonight, Kendall told us, "Abraham Lincoln is in a movie, and he hunts for ghosts." Misty: "But it's not really true, though. That's what Mr. Bret was saying." Emily: "Yes it is. 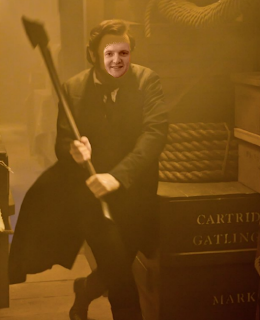 He's a Vampire Hunter." Misty: "No. That's just made up. Abraham Lincoln did not do that." Kendall: "So, Mr. Bret is a vampire hunter?" Misty: "No. Our preacher does not hunt vampires." Kendall: "Daddy, will you please hand me that trampoline thing? ... I mean, that Fairy Godmother." Me: "Yeah, I get those two things mixed up all the time, too." While tucking the girls into bed tonight, Misty asked each of them, "Who's the bravest person you know?" It's an idea she got from iMOM: 20 Pillow Talk Questions for You and Your Child. Emily didn't miss a beat in her reply. "Daddy," she said. "Because he killed that snake in the backyard." Kendall, on the other hand, responded, "Merida." When asked why, she answered in a "duh" sort of voice. 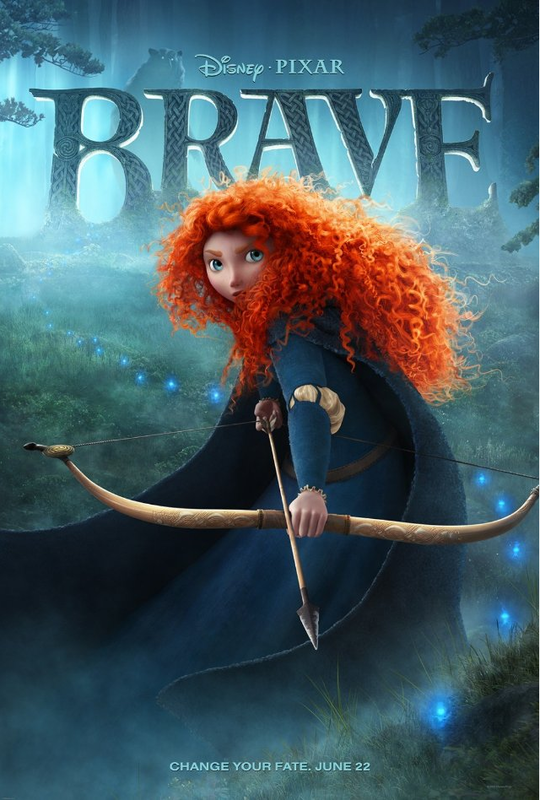 "Because 'Brave' is the name of her movie." But as if being overlooked in favor of a cartoon character (who, I should point out, Kendall does not know) wasn't bad enough, Kendall managed to add insult to injury. When Misty shared Emily's answer with her, she replied, "Huh. Yeah, Daddy's brave. Like a girl." I can tell this Father's Day is going to be awesome. Since rain kept us from fulfilling our promise to take the girls to the pool this afternoon, we decided to let them play in the rain instead. They didn't seem to believe us at first, as if it were some grand reward that couldn't possibly be true. 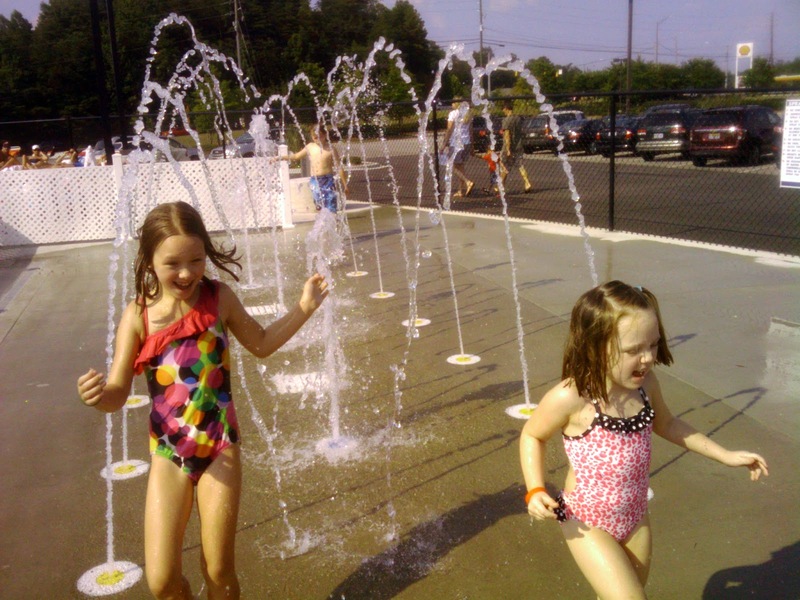 I told them about how, when I was a kid, I loved splashing in the gutters and finding worms on the sidewalk. Emily and Kendall didn't do any puddle splashing or puddle jumping, but they enjoyed running around the yard getting wet. 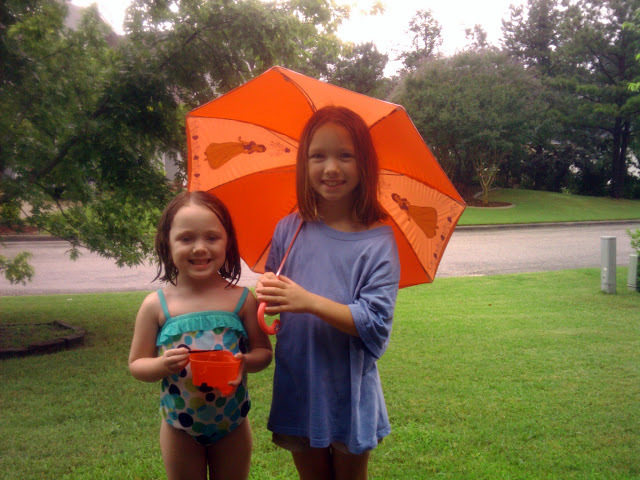 Kendall insisted on wearing her bathing suit, and Emily opted for an umbrella (mainly so she could twirl it). Seeing them use their imaginations always makes me happy. Emily sat under the tree pretending to be on a raft, while Kendall pretended to be a fairy painting color on the leaves.